Dave Dunwoody reports on the UWF Argonaut Football team's first spring practice. Before the workout Shinnick, who also began the football program at North Carolina-Pembroke from scratch, says at this point they’re further ahead at UWF compared to the same time at Pembroke. After warming up, the players broke up into their position groups, at least as well as nine can break up. The players will go through five practices during the spring semester. The other four are set for next Wednesday, the 25; March 31, and April 2 and 8, all at the Intramural Field. After the sessions, Shinnick expects to a have a better idea of what they can do. The nine players going through spring drills will be joined by around 30 signees announced last month, and possibly some walk-ons from a tryout this summer. In all, UWF football could be around 110 players strong for the 2015 redshirt year. Wednesday was National Signing Day for high school football players seeking a college and vice versa. For the first time, the list of universities competing for talent includes the University of West Florida, which begins play in 2016. 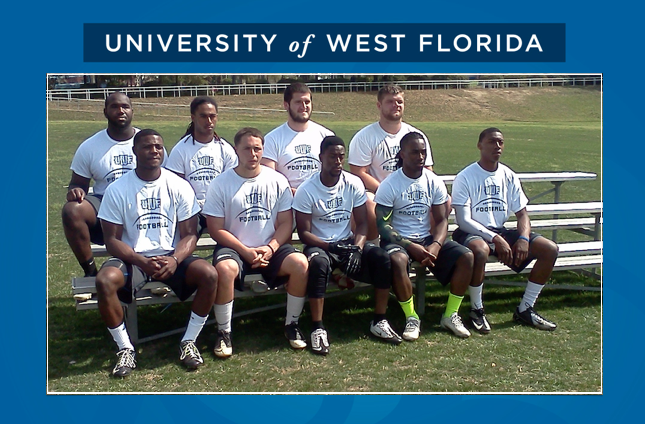 The University of West Florida will field its inaugural football team in the fall of 2016. Leading the Argonauts will be Pete Shinnick – who is no stranger to starting a program from scratch. WUWF’s Dave Dunwoody recently sat down with the head coach. The 48-year-old Shinnick comes to Pensacola from the University of North Carolina-Pembroke, where he started that football program from scratch. In seven seasons, the Braves won 55 games – including a 9-2 mark last year while advancing to the second round of the NCAA Division II playoffs. The University of Alabama-Birmingham’s announcement Tuesday that its football program is going away is raising questions about how other football-playing schools in the region, including the University of West Florida, could be affected. UAB becomes the first since Pacific in 1995 to shutter its football operation. The decision was made after a campus-wide study conducted by a consulting firm over the past year, which shows UAB subsidizes two thirds of the program’s $30 million operating budget.